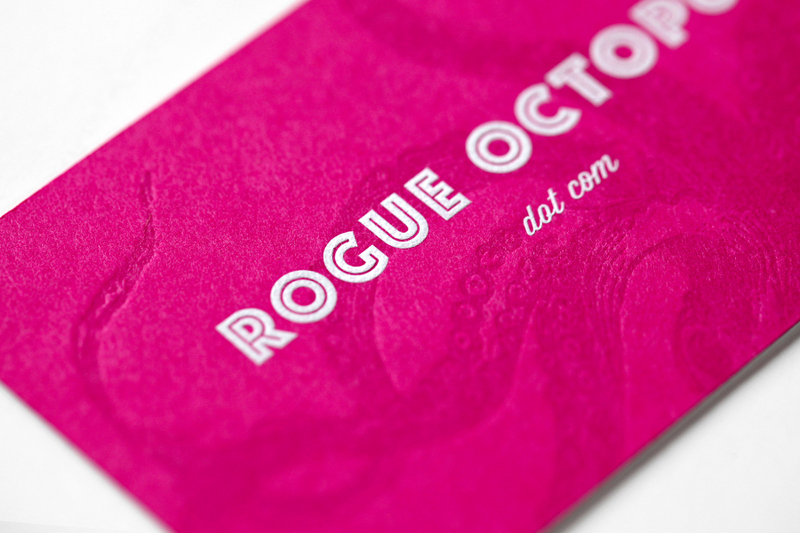 We recently designed a simple brand identity system for Seattle-based music licensing group, Rogue Octopus. 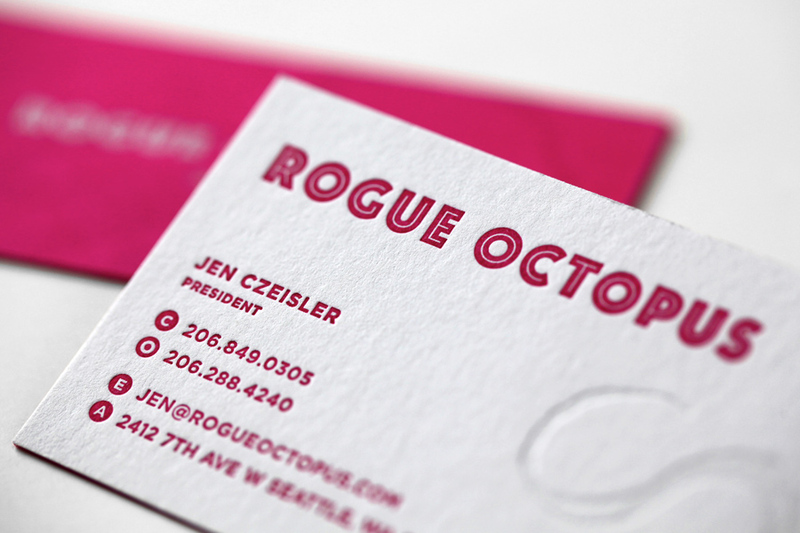 We worked closely with Sub Pop expat, Jen Czeisler to realize her vision for the new brand. The result is simple, striking and unexpected. We designed a double-sided letterpressed business card which was printed impeccably by our friends at Studio On Fire. 110lb. Crane Lettra Flourescent White duplexed with 100lb. French Pop-Tone Razzle Berry cover to get to an overall weight of 210lb. 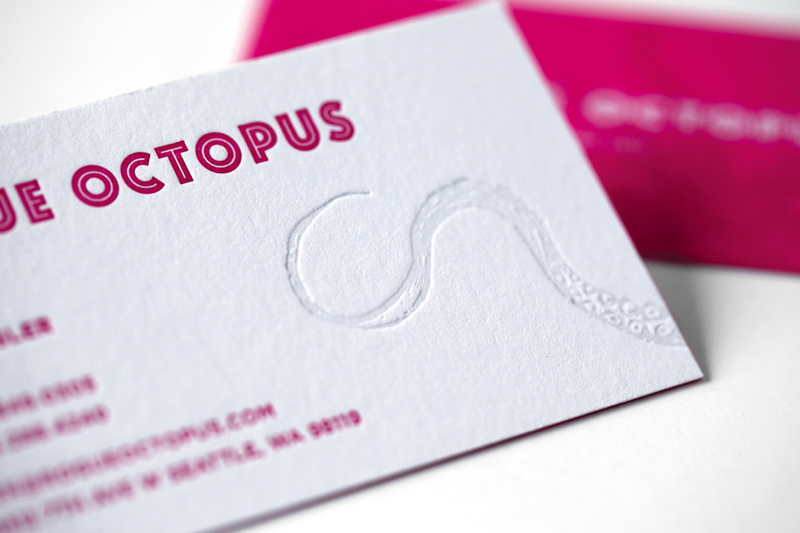 The tentacles on both sides of the card are tonal impressions and the type on the back is engraved white ink. You designing very professional brand identify design. It looking very cool. Thanks for sharing such a nice post on brand identity design. Gorgeous brand identity! Very impressive. I saw Jen’s card recently and have been actually carrying it around because I love it so much. I love the quality of the letterpress and card stock too. I was wondering what typefaces you used for this project? the party to enjoy. They were usually full of flavour along with the range of different types of fruity jellies was large – so I was in heaven. from the gaming account that you pick up the character gains a level. In the simpsons tapped out hack response to the App Store. However, all genres are present online everytime. there are a couple of other maintenance tips you should follow on a regular basis to keep your PC running smoothly. use the Photoshop elements and worked with several large files and the computer did not lag at all. except I know I am getting know-how everyday by reading thes good posts. You could definitely see your enthusiasm in the paintings you write. The sector hopes for even more passionate writers such as you who are not afraid to say how they believe. At all times follow your heart. “What power has law where only money rules.” by Gaius Petronius. This site is my aspiration, very excellent design and style and perfect content. Always a significant fan of linking to bloggers that I appreciate but dont get lots of link like from. We prefer to honor numerous other online web-sites on the web, even though they arent linked to us, by linking to them. Beneath are some webpages really worth checking out. Below youll uncover the link to some web pages that we think it is best to visit. That is the finish of this article. Right here youll discover some sites that we believe you will appreciate, just click the links. Always a major fan of linking to bloggers that I really like but dont get a lot of link adore from. That could be the end of this report. Right here youll come across some web-sites that we feel you will enjoy, just click the links. We like to honor quite a few other internet web sites around the net, even though they arent linked to us, by linking to them. Below are some webpages worth checking out. Right now it seems like Movable Variety is the best blogging system out there appropriate now. (from what I have go through) Is that what you are making use of on your weblog? Correct now it looks like Movable Type is the top blogging system out there correct now. (from what I have read through) Is that what you are utilizing on your weblog? We prefer to honor lots of other web internet sites around the web, even though they arent linked to us, by linking to them. Underneath are some webpages really worth checking out. 1 was produced only for exhibiting seconds and little even though a various one employing minute graduations is created for implying hours. Es poco frecuente encontrar a blogers con conocimientos sobre este asunto , pero creo que sabes de lo que estás comentando. Gracias compartir información como este. We like to honor lots of other world-wide-web web pages around the internet, even if they arent linked to us, by linking to them. Underneath are some webpages worth checking out. We prefer to honor several other online web sites around the net, even though they arent linked to us, by linking to them. Beneath are some webpages worth checking out. That may be the end of this post. Right here youll uncover some websites that we consider you will enjoy, just click the hyperlinks. That is the end of this post. Right here youll find some web pages that we feel youll enjoy, just click the hyperlinks. Hey there! I just lately observed your internet site and I definitely take pleasure in it. I enjoy to communicate about omega xl at times. Very good to be about, many thanks a good deal! We prefer to honor a lot of other world-wide-web websites around the net, even when they arent linked to us, by linking to them. Beneath are some webpages worth checking out. Excellent post. Everyone must read this. Excel is great until you grow your business. I was fine until I got my second rental apartment, then it becomes more complicated – copying formulas and structure between sheets inevitable brings pain and suffering and errors. I prefer specialized apps over Excel any day and it is fine to have a specialized app for the particular need. E.g. I use Landlord app for tracking my rental income and expenses, Mile IQ for tracking my travel, HoursTracker for tracking my hours. All of them are in so many ways better than any spreadsheet can be thanks for integration with smartphone capabilities like camera, email/messages integration, auto-location tracking etc. Good put up! We will be linking to this excellent publish on our site. Keep up the very good creating.